A communication assistance app for those who have difficulty speaking is getting an important update Wednesday: It now has real children’s voices that will play when a picture, phrase or word is tapped on screen. Proloquo2go, an iOS app(s AAPL) has been used for several years by both adults and children diagnosed with autism, cerebral palsy, Down’s Syndrome, as well as adult stroke victims or anyone who’s lost the ability to speak clearly. But after a huge effort in improving text-to-speech, children’s voices are now an option. Proloquo2go is just one app made by Amsterdam-based AssistiveWare, which makes software that helps those with special needs use technology. AssistiveWare worked with the linguists at Acapela, a European text-to-speech company, for a year and half on crafting these children’s voices for its mobile app. There are now four children’s voices total — two American English and two British English. The task of creating speech recordings is enormously expensive and time-consuming, so it’s no wonder many companies have relied on adult voices digitized to sound more child-like. As founder David Niemeijer told me in an interview on Monday, “People were managing with adult voices, no one thought it was important to make the investment” in adding voices that sound like a kid would sound. But it’s more important than you’d think for children — and their parents — to communicate with a recorded voice that sounds closer to their natural voice. Especially for very young kids who need the assistance, they can start to do speaking and voice training with the app so they can, if possible, begin to develop their own voice earlier in life, Niemeijer said. That’s why each voice can even be customized to be higher or lower. Proloquo2Go actually began as Proloquo for the Mac (pro lo quo means “speak out loud” in Latin), and was translated to a mobile app for iOS in 2009. Then it was used on the iPod touch and iPhone. By the time the iPad came around in early 2010, the corresponding app was available the day the tablet launched. But the iPad has become by far the most popular way to use the software, Niemeijer told me. Ninety percent of Proloquo2go users use the iPad app, while 20 percent also use an iPhone or iPod touch. 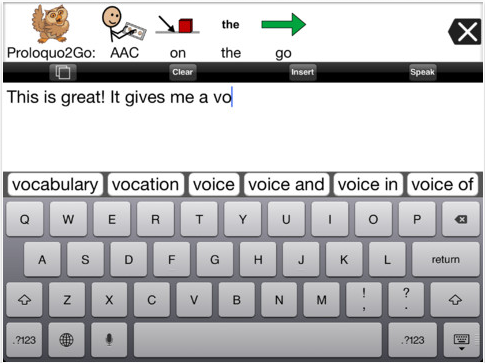 There are several augmentive and alternative communication (AAC) apps available for the iPad, including Verbally, Alexicom AAC and Tap to Talk, which range from free to $99 yearly subscriptions. The iPad has come to be prized in the accessibility and special needs communities because of its portability, screen size and cost. Dedicated communication aids used to cost multiple thousands of dollars and were often heavy. Those two characteristics put them out of many people’s price range, and the bulkier form factor wasn’t suitable for really young children who needed help communicating. While Proloquo2go costs $189.99, even combined with the cheapest iPad (the $399 iPad 2), it comes out cheaper than AAC technologies that were the norm before iOS.